Last week in Monitoring Factory Oxy Sensors, Part 1 we looked at factory narrow band sensors – the most common sensors found in cars. Now it’s time to examine how you can monitor the wide-band sensors that are becoming much more common, especially in hybrids and super economical cars. As their name suggests, wide band sensors operate over a much broader range of air/fuel ratios than narrow band sensors. This is especially important in cars that run ultra-lean cruise capability, where the air/fuel ratios must still be monitored by the ECU when they are beyond the measuring capability of narrow band sensors. Wideband sensors are used by aftermarket air/fuel ratio measuring instruments, and there is plenty of material available on the web about these sensors and how they work. The trouble is, most of the explanations are largely incomprehensible to normal people! However, to understand how to make use of an existing, in-car wideband oxygen sensor, you don’t need to know anything much about the sensor chemistry or control electronics. 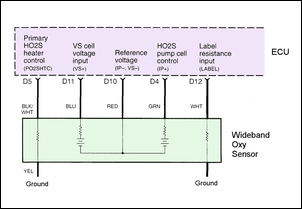 A wideband oxygen sensor consists of two sections. These comprise a pump cell and a reference cell. The pump cell has a chemical effect on the behaviour of the reference cell, as indicated here by the green arrow. 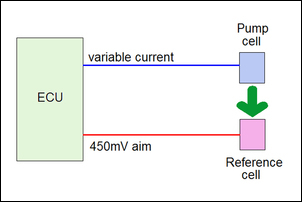 The reference cell’s output voltage is monitored by the ECU. The ECU aims to achieve an output by this cell of 450mV – just under half a volt. 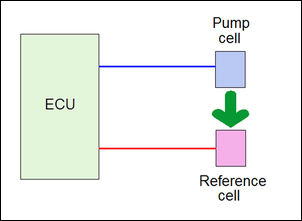 The other cell, the pump cell, is controlled by the ECU varying the current flow through it. 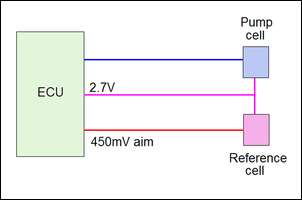 If the reference cell’s output is not 450mV, the ECU adjusts the current through the pump cell until the reference cell is again back at 450mV. 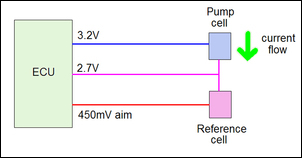 If the reference cell is at 450mV, no current is passed through the pump cell. In addition, the direction of current flow through the pump cell can be changed. If the output of the reference cell is 450mV without any current flow being needed through the pump cell, the air/fuel ratio must be at stoichiometric (14.7:1 for normal petrol). 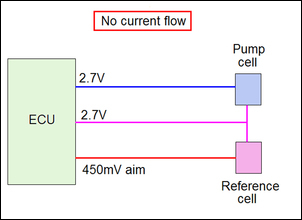 If current flow is needed in one direction before the reference cell gets to 450mV, then the mixtures must be lean. If current flow is needed in the other direction, then the mixtures must be rich. The magnitude of this positive or negative current flow reflects how lean or rich the mixtures are. So how does the ECU control the current flow? Have a look at this diagram. We’ve added one more wire, a constant voltage supply. However, if the ECU raises the voltage on the blue wire to (say) 3.2V, then current will flow through the cell in the direction of the arrow. 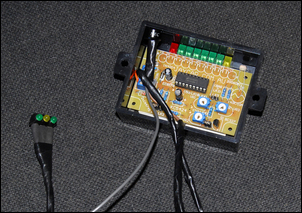 Conversely, if the ECU lowers the voltage on the blue wire to 2.3V, current will flow the other way. As described above, the amount (and direction) of current passed through the pump cell by the ECU is indicative of the measured air/fuel ratio. However, measurement of this current is most easily achieved by measuring voltages rather than currents. 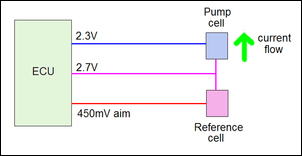 As we showed above, in order that current flows through the pump cell in an anti-clockwise direction, the ref voltage has to be higher than the pump cell voltage. Therefore, if we measure the voltage between the pump cell and ref voltage wires, we’ll find a reading of (in this example) +0.5V. But if the current flows the other way, the voltage will need read a minus value – in this case, -0.4V. Reading both positive and negative voltages can be achieved by a normal multimeter, but (as with conventional oxy sensors), if the reading is changing fast, a multimeter is hard to read accurately. It’s also awkward to fit a multimeter on your dashboard! 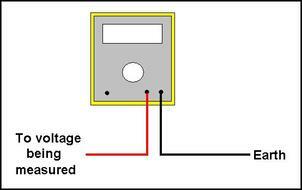 However, there is a very simple trick that can be employed to allow us to use a meter that measures only positive voltages. 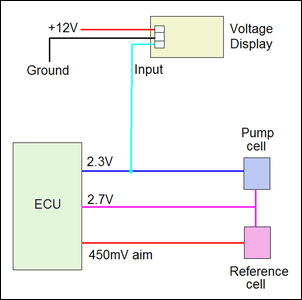 We already know that if the pump cell voltage is the same as the reference voltage (2.7V is the examples we’ve been using here), no current will flow in the pump cell. 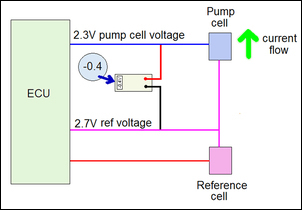 If the pump cell voltage rises above the reference voltage, current will flow in one direction. 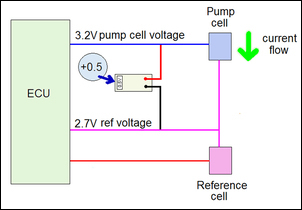 If the pump cell voltage falls below the reference voltage, current will flow the other way. Therefore, by measuring just the pump cell voltage, we still know the variation in mixture strength! 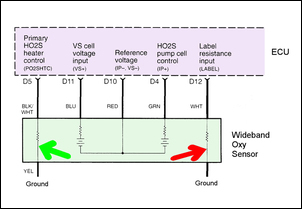 If the pump cell voltage is above 2.7V (or whatever the reference voltage is), the mixtures must be lean. If the pump cell voltage is below 2.7V, we know the mixtures must be rich. And, best of all, these voltages all stay positive! But how can we easily display these values? As covered in Universal Bargraph Voltage Display, a very versatile automotive LED bargraph kit already exists. It’s called the Automotive Voltage Monitor. In kit form, the bargraph display costs just AUD$19.95; the kit is also available pre-built for AUD$76. 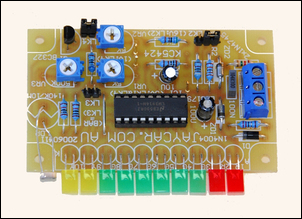 What makes the bargraph kit particularly suitable for this application is that the voltage at which the top and bottom LEDs light up can be independently set, the display then automatically scaling the ‘in-between’ LEDs into ten equal steps. Let’s take a specific example. On the hybrid Honda Insight, over a range of different driving situations, the monitored pump cell voltage varies between 2.0V and 3.8V. Therefore, the bar graph display needs to be set so that the bottom LED lights at 2.0V and the top LED at 3.8V. After the range has been set correctly, the Automotive Voltage Monitor is then connected to power and ground, with its input signal wire connected to the pump cell control lead. OK - but let’s take a few steps back. The easiest way of finding the wire on which the varying voltage signal is present is to directly measure it with a multimeter, with one lead grounded to the chassis and the other lead used to do the probing. The oxy sensor should be plugged in and working and the car running. On one oxygen sensor wire you will find a voltage of about 0.45 volts. It changes only a little with driving, and is nearly constant at idle. That’s likely to be the reference cell voltage. On another wire you’ll find a fixed voltage – in the Honda’s case, 2.7V. This voltage does not vary with driving - it’s the constant voltage. Finally, you’ll find a wire on which there is a small voltage variation (eg 2 volts total) that, with different driving styles, occurs above and below the reference voltage. This is the pump cell control - the one to monitor for watching air/fuel ratio variations. In addition, there is likely to be three or four other wires. These are for a calibration resistor and the oxygen sensor heater. Both the heater and the trim resistor are likely to have one side grounded to the chassis. So how does it all work on a real car? Let’s have a look at the Honda Insight. 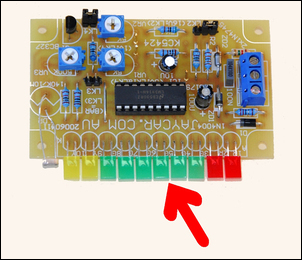 The heater wiring is indicated with a green arrow, and the calibration resistor with a red arrow. 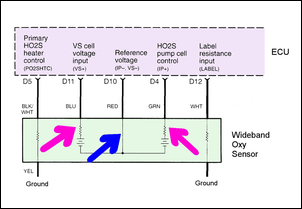 The centre lead (marked with the blue arrow) must be the reference wire (2.7V) and so therefore the pump cell control lead must be one of the wires marked with purple arrows. In fact, it is the right-hand wire (green on the actual car) that is the correct wire to monitor. Clearly, it makes things a lot easier if you have a wiring diagram available, but even in its absence, some good detective work with a multimeter should still locate the correct wire. As with the narrow band display we covered in Part 1 of this series, the bargraph display described here does not read out the numerical air/fuel ratio. That is, it doesn’t show 13:1 – or even 16.7:1. Many people will see this as a major deficiency, but I do not. Unless you are tuning the action of an engine management interceptor or revised engine management software, you have no need to know the exact numerical values. Knowing whether the car is running at stoichiometric, rich, very rich, lean or ultra-lean is what’s really wanted to be known. However, if you know the leanest that the car ever runs, and the richest the car ever runs, some numbers can be worked out. In my Honda, use of an external MoTeC air/fuel ratio meter shows that, when the injectors are actually operating, the richest air/fuel ratio is about 12:1 and the leanest, about 25:1. 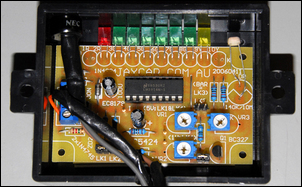 The Automotive Voltage Monitor kit uses rectangular LEDs mounted along one side of the board. The kit can therefore be mounted in a small box, with the LEDs protruding through a slot cut in one side wall. The completed assembly is small enough to mount on top of the steering column, or in some other convenient place on the dash. Alternatively, you may choose to remote-mount all the LEDs, connecting them via ribbon cable to the module. 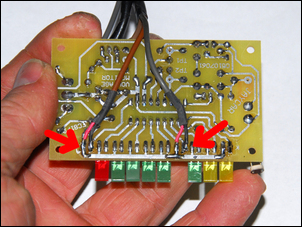 If you do this, remember that the LEDs have to be wired with the correct polarity, and mounted in the correct sequence. Remote mounting the LEDs means that they can be squeezed-in almost anywhere. You can even use 3mm round LEDs (making the finished display even smaller) and arrange the colours of the LEDs however you wish. Another approach is to do what we did, and that is to remote-mount only a couple of the LEDs (arrowed). In the Honda Insight in which the system was installed, it was decided that only two conditions needed to be seen. The first was when the car was in lean cruise – that is, running with an air/fuel ratio of about 25:1. The second condition was when the engine management dialled-up a very rich air/fuel ratio – about 12.5:1. So how is this achieved? With the upper and lower pots on the Automotive Voltage Monitor kit set so that one end-LED of the full bargraph display illuminated at the lowest voltage ever measured (2.0V - rich) and the other end LED illuminated at the highest voltage ever seen (3.8V – lean), the LED that turned on in lean cruise was found to be the fourth from the ‘3.8V’ end. This ‘lean cruise’ LED was removed and extension wires soldered to the PCB pads to allow a LED showing this condition to be mounted on the steering column. This LED lights only in lean cruise – even leaner mixtures (eg indicating injector shut off) cause the next LEDs along in the bargraph to light, so the ‘lean cruise’ LED stays off (or flashes only momentarily as the mixtures slide past this point). To ensure that these ‘monitor’ LEDs were in fact reflecting the designated air/fuel ratios, checking was carried out using a tail-pipe mounted MoTeC professional air/fuel ratio meter. This showed that yes, the ‘lean cruise’ and ‘rich’ LEDs worked perfectly – in fact, they were faster to respond than the MoTeC meter. You set the on-board posts so that the lowest and highest voltages that ever occur are displayed on the respective end LEDs of the bargraph display. You drive the car in a variety of conditions, while carefully observing on the full bargraph display what mixtures are being run in what conditions. Doing this makes it easy to see when lean cruise occurs (if in fact it does in your car), and when richer mixtures are used. You remote mount those LEDs that show the conditions you want to monitor. Note: from a cold start, the display can take a minute or so to come alive, the time the oxy sensor takes to come up to operating temp. In the main text we’ve said that on the Honda Insight, two LEDs from the bargraph display were remote-mounted on the steering column – one showing lean cruise, and the other showing rich mixtures. So why in the pics are there three dashboard LEDs? In this car, the other very useful indication of what is going on is to show the action of the Exhaust Gas Recirculation valve. This is displayed by the third LED. As we covered in Tweaking the EGR, Part 1 and Tweaking the EGR, Part 2 the Honda (and probably many other cars) can be improved in fuel economy by running, at small throttle openings, greater-than-standard amounts of Exhaust Gas Recirculation (EGR). 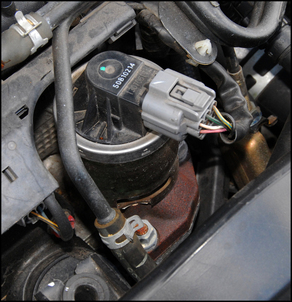 The Honda uses a 12V pulse-width modulated EGR valve and by wiring the LED (and suitable dropping resistor) in parallel with the EGR valve coil, the LED illuminates when the EGR valve is open. Furthermore, it increases in intensity as the valve opens to a greater degree. The only tricky aspect was setting the value of dropping resistor so that, at maximum brightness, this LED looked the same as the LEDs being driven by the Automotive Voltage Monitor. To achieve this, a 1 kilo-ohm pot was wired as a variable resistor and this was adjusted until the correct brightness was achieved. Note: you cannot use a LED without the dropping resistor – it will immediately die if connected straight across 12V. As with the simple Mixture Meter that monitors a narrow band sensor (covered in Part 1 of this series), the monitor for wideband sensors can be used to aid fuel economy and also show that the engine management system is working correctly. The first step is to simply watch the display over a wide variety of driving conditions. From this, you’ll soon learn when the car is in closed loop, when it is in lean cruise (if ever), when the mixtures are enriched, and when the injectors are switched off. (For more explanation on these terms, see Part 1). In most cars, the greatest gain in fuel economy will be made if the fuel enrichment that occurs at high loads is rarely seen! For example, when climbing a hill, you might find that lifting your foot just a fraction causes the ECU to switch back to closed loop from enriched mode. Lifting your foot may make almost no difference to your speed up the hill, but will reduce fuel consumption. Moving to higher gears earlier may result in the car staying in closed loop; in other cars it will be better to rev slightly higher at a reduced throttle angle before changing up. In some cars, the injector shut-off does not function unless revs are above a certain level. When travelling down a long hill with no throttle being applied, in these cars it can be better to drop down a gear, so lifting no-load revs and triggering the injector shut-off. In other cars, the clear indication of when the car is in lean cruise allows the driver to better keep the vehicle in that mode – to put this another way, it’s much easier to see in what conditions the car enacts lean cruise and in what conditions it leaves this mode. In performance applications, the simple bargraph monitor of the wideband sensor will give an accurate indication of the relative mixture strength. It appears that when in closed loop, the output of a wideband sensor does not fluctuate in level like a narrow band sensor. This is almost certainly because the ECU doesn’t need to actually pass through 14.7:1 before the sensor output changes. With the techniques covered in this series, both narrow band and wideband oxygen sensors can now be easily and cheaply monitored. The monitoring displays are not only suitable for spotting engine management faults as they develop, but by showing the driver the most economical techniques to use, can also improve real-world fuel economy. Finally, in cars that are modified, the wideband sensor display can be used for the tuning of relative mixtures, and to show if a dangerous high load lean condition is occurring.